Wiersema et al. first reported results of endoscopic ultrasonograpy-guided celiac plexus neurolysis (EUS-CPN) in 1996 . Since then, this method has been evaluated in only a few observational uncontrolled studies and a handful of randomized controlled trials (RCTs) that focused on technical variations of the procedure but did not include a “no active intervention” arm  . Consequently, although the results indicated that EUS-CPN reduces pain and opioid use in patients with pancreatic cancer, definite conclusions about the true effectiveness of this method have been precluded by the absence of comparative studies with conventional (systemic) analgesic therapy  . A study by Wyse et al. has now bridged this important research gap. A total of 98 patients with newly diagnosed, painful, inoperable pancreatic adenocarcinoma were randomly assigned to receive either early EUS-CPN or conventional pain management (control group) . Study patients were selected from a cohort of 580 consecutive patients referred for EUS diagnosis or staging of suspected pancreatic carcinoma; 482 of these patients (83 %) did not meet study entry criteria because they (i) did not have biopsy-proven cancer, (ii) had cancer but were possibly operable, (iii) had no pain, (iv) had an expected survival of less than 3 months due to metastases, or (v) refused to participate. The primary outcome of the study was mean percentage change in abdominal pain score at 1 month and 3 months compared with the baseline. Secondary endpoints included absolute change in pain scores, change in morphine equivalent consumption, change in quality of life, and overall survival. Pain levels were quantified using a 7-point Likert pain scale. Quality of life was quantified using a Digestive Diseases Questionnaire-15, an instrument that does not include a pain domain. EUS-CPN was performed using a standard 19-G needle, with bilateral injection around the celiac axis with 10 mL of 0.5 % bupivacaine followed by 20 mL of absolute alcohol. 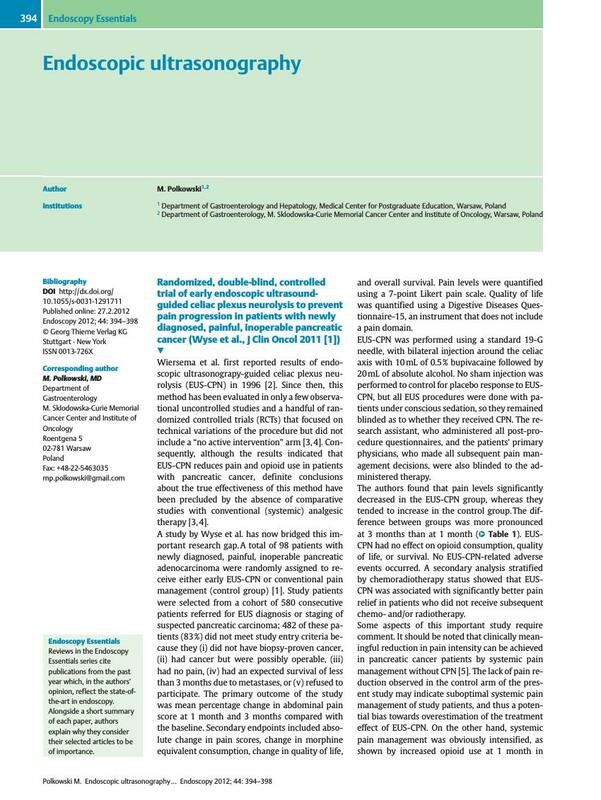 No sham injection was performed to control for placebo response to EUS-CPN, but all EUS procedures were done with patients under conscious sedation, so they remained blinded as to whether they received CPN. The research assistant, who administered all post-procedure questionnaires, and the patients’ primary physicians, who made all subsequent pain management decisions, were also blinded to the administered therapy. The authors found that pain levels significantly decreased in the EUS-CPN group, whereas they tended to increase in the control group. The difference between groups was more pronounced at 3 months than at 1 month ([Table 1]). EUS-CPN had no effect on opioid consumption, quality of life, or survival. No EUS-CPN-related adverse events occurred. A secondary analysis stratified by chemoradiotherapy status showed that EUS-CPN was associated with significantly better pain relief in patients who did not receive subsequent chemo- and/or radiotherapy. Early endoscopic ultrasonography-guided celiac plexus neurolysis (EUS-CPN) vs. conventional pain management in patients with newly diagnosed, painful pancreatic adenocarcinoma. Results from a randomized double-blinded study . 1 A total of 98 patients were randomized (49 per study arm) and received allocated treatment; however, two of them were later revealed ineligible for inclusion in the study. It remains unclear whether they were included in the analysis or not. Some aspects of this important study require comment. It should be noted that clinically meaningful reduction in pain intensity can be achieved in pancreatic cancer patients by systemic pain management without CPN . The lack of pain reduction observed in the control arm of the present study may indicate suboptimal systemic pain management of study patients, and thus a potential bias towards overestimation of the treatment effect of EUS-CPN. On the other hand, systemic pain management was obviously intensified, as shown by increased opioid use at 1 month in both study groups. The fact that only two patients in the control group (4 %) were referred for rescue EUS-CPN also suggests that pain management was adequate. The lack of reduction in opioid use after EUS-CPN in the present study is in contrast to the results of a recent systematic review by the Cochrane Pain, Palliative and Supportive Care Group . This review of six RCTs on percutaneous or intraoperative CPN found that use of opioids (and their side effects) significantly decreased following CPN, and this effect persisted until patients’ deaths. It should be noted, however, that the largest available RCT on percutaneous CPN failed to demonstrate reduction in opioid use in the treatment arm . A potentially important (and unexplored) factor to be considered while analyzing the impact of CPN on opioid consumption is the timing of the intervention . It is possible that the impact of early CPN performed at the time of the diagnosis, in patients for whom pain management has not yet been maximized, may differ from that in patients with pain that is already refractory to high opioid doses. Despite these uncertainties, the fact remains that when compared with conventional pain management, early EUS-CPN resulted in better pain control with similar doses of systemic analgesic drugs . The effect of EUS-CPN was much smaller in patients who subsequently received chemo- and/or radiotherapy, so EUS-CPN is probably superfluous if chemo- and/or radiotherapy are planned. However, a further management plan is usually not determined at the time that EUS is performed, and EUS-CPN is safe and adds only approximately 2 – 3 minutes to the procedure duration; therefore, the authors concluded that EUS-CPN should be considered during diagnostic and staging EUS in all patients with confirmed painful, locoregional, and inoperable pancreatic cancer and a predicted survival of several months . It should be noted that a prerequisite for this one-stage approach is the capability to confirm cancer diagnosis by rapid on-site cytological evaluation (ROSE) of EUS-guided fine needle aspiration (EUS-FNA) samples.